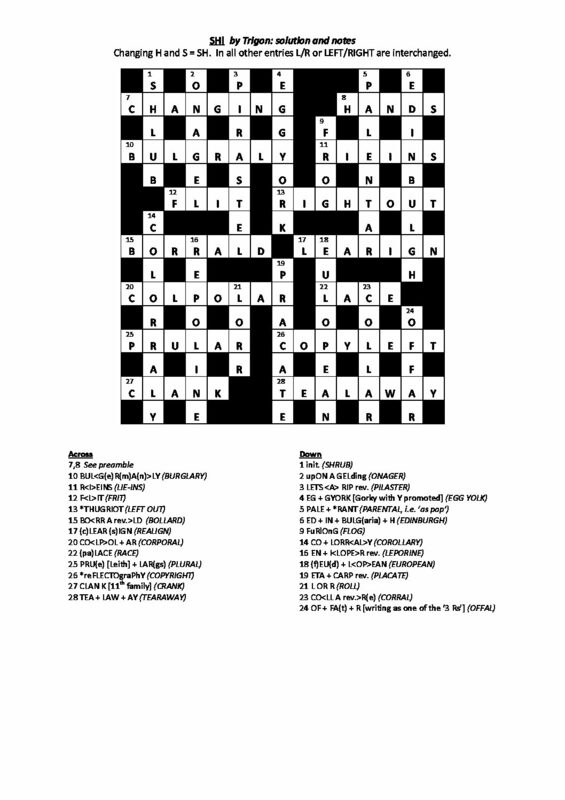 Hello, having had my first puzzle published in 1 Across a year ago, I’d welcome solvers’ feedback on this one. Solution and notes to follow in due course. I will try your puzzle but I don’t have software to read docx files. Can you post a pdf, pls? Many thanks, Whynot; here it is in pdf. Phew! What a mindbender! It’s taken me a number of visits, but I’ve just completed it (albeit with 16d BIFD) and must say it was very satisfying to do so. It was really confusing to try and think about possible answers while 7 8. First of all I thought I’d never get the conceit, but 9 was the first clue to give some indication what it was about and half an idea about 21 let me fill in 8 and get started. I thought 7 would start with S (don’t understand the title as it wasn’t), which set me back a bit. The grid isn’t well-connected between quarters, so they mostly fell one at a time with very few filled in the bottom half when the top was almost complete and the SW corner last to fall when I thought of the word defined in 16 — although I had to look it up as the version in my head was one letter short of the actual word. I thought 12 looked impossibly hard, but finally twigged. Younger solvers will surely fail to see the reference? I’d vaguely heard of a relevant person for 25, luckily, but had no idea who that was (see my comments to “Very well done if you got that at home”). I was doubtful about “Number 11” in 27, which I read as the second element in a charade but it perhaps works as you’ve explained it. 28 was very clever. Great surface. 1 made me sure what the theme was (and 13 was easy enough to show a different interpretation). In 6, isn’t the def doing double duty as part of the wordplay, or is there an abbreviation I’m unaware of? 22 was a great surface with perfect cryptics, one of a number of musical refs. Are you a musician, I wonder? I didn’t parse 24 completely, but got it anyway. Maybe some qualification of “writing” would have helped. A very clever puzzle which I enjoyed chewing on over the course of several days, on and off. Thanks for the fun, Trigon! Glad you had fun with it, Whynot. 6: H is the vehicle registration code for Hungary. 12: Agreed that the reference is dated, though it rescued me from a far clunkier definition. 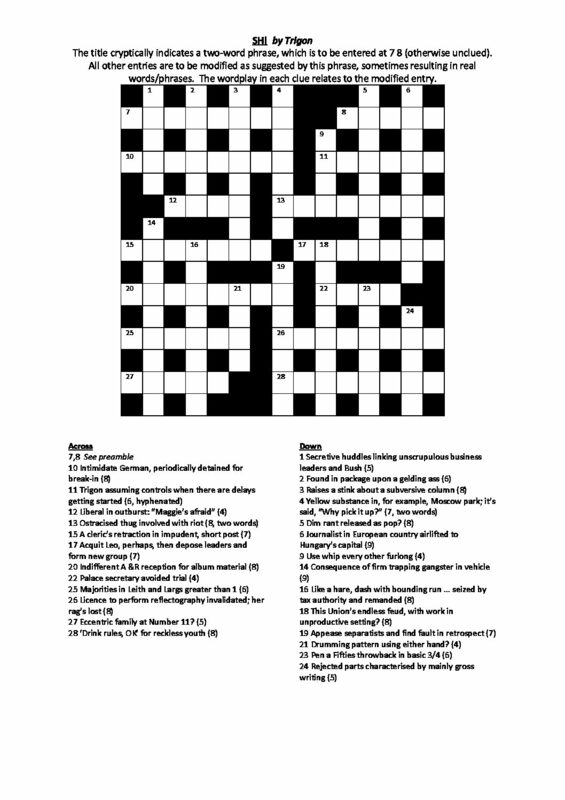 24: Occasionally I see R clued in this style in a proper puzzle (admittedly, it’s more often signified by ‘reading’), so I thought it was fair game albeit hard. There might be a penny-drop moment still to come regarding the title. Is it too spoilerish to invite you to look at 8 in instalments? 6. Ah, yes. Thought there must be something. Must learn all those sometime. Luckily, my interpretation helped me solve it. dialect? It’s not in my old Chambers. 24. Funnily enough, I saw R clued this week as “basic skill” in Moutarde’s Rookie 209 on Big Dave. I didn’t understand it then either! I have seen reading for R before, but always thought that was a known abbrev., independent of its two fellows. Turns out it’s not. Compliments on the fill, btw, which can’t have been easy, even though you could apply the changes after finding a suitable fill, I suppose? Coming late to this and certainly finding it a challenge! Just 8 solutions in the grid so far. I think I see what is going on but haven’t cracked 7,8 yet. If I have got a correct handle on it, the modified answer to 1 fits the definition just as well as the unmodified – at least for the GW version! Now finished, although not without resorting to help from Chambers pretty frequently. An enjoyable struggle, neverthheless. I agree with Whynot that the division of the grid into almost independent quarters adds significantly to the difficulty. The wordplay in 1 (which was first in) was clear and gave me a handle on what was going on, confirmed by 12. Being of a certain age, that was also reasonably straightforward. I should have seen 2 much sooner than I did and being a denizen of Leith, I swallowed the misdirection in 25 hook, line and sinker. All in all a very clever piece of work which must have been as hard to set as it was to solve. Thanks for pointing that out, Trigon.I didn’t think about it very carefully did I? The gridfill was an extraordinary feat. To visualise words like 10a and 20a to mention only two that had me uttering them out loud and laughing over and over and to have the theme relevant to every answer shows great expertise. I really enjoyed it and found it very satisfying to solve. And it was a bpnus when you made me understand the title, too. Thank you. Hello Trigon, Wow…what a feat of setting…must have taken you some time to put together. Hats off to you! I cracked the conceit reasonably early on but ran into the long grass with 13a which made me backtrack as I couldn’t figure one of the checked squares…so I must say I had to take a millisecond of a glance at the solution as I was pulling my hair out after picking it up and putting it down again for almost a day! But then seeing what you’d cleverly done, I was back on the horse again. I got most of the grid filled in the end. I don’t understand 12a even after seeing your solution notes…could you explain please?? Glad you still have some hair to spare, Wire! There’s been some discussion of 12 earlier in this thread; it’s a regional variant of ‘frightened’, brought to wider notice by Margaret Thatcher’s Commons exchange with Denis Healey in 1983. Never really got to grips with SH including the title which surprised me because I found the cluing straightforward on your other offering I got 7A OK but I had the wrong word in 8A and for the ones I did solve I was never quite sure which answer to enter, the cluing being a bit Hyper-cryptic as sometimes in the Genius series. I enjoyed both and so Thank-you for your efforts.